Sixty years ago, the Supreme Court handed down its landmark Brown v. Board of Education decision, holding that racial segregation in public schools violated the Constitution. But while schools have become more integrated, in part due to broad demographic trends, white students remain significantly less likely than minorities to attend diverse schools, according to an analysis of U.S. Department of Education data by the Pew Research Center. In 2010, some 15.9% of whites attended a school where minorities made up at least half of all students. By comparison, more than three-quarters of Hispanics and blacks (and six-in-ten Asians) attended these “majority-minority” schools. White students, while still a majority in the nation’s public school classrooms, have shrunk in number. From 1990 to 2010, the number of white students decreased by 2.1 million. Meanwhile, the number of black, Hispanic and Asian students in those schools has increased by 8.9 million. White students in 2012 made up 51% of public school students, down from 68% in 1990. Fueled by these demographic trends, the share of white students enrolled in majority-minority schools has nearly doubled over the past two decades, from 8.4% in 1990 to 15.9% in 2010. 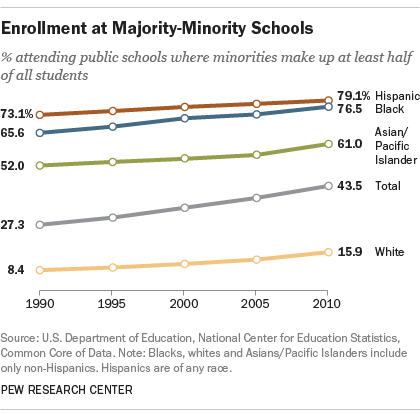 The share of black, Hispanic and Asian students enrolled in majority-minority schools also increased during this time—for Hispanics, from 73% to 79%, for example. Among Latino students, segregation has grown most in the western U.S., according to a new report from the Civil Rights Project at the University of California, Los Angeles. In 2011, some 45% of Latinos in the West attended schools where at least nine-in-ten students were minorities, up from 29% in 1991. In the Northeast, about 44% of Latinos attended these schools in 2011, down from 47% in 1991. Among blacks, students in the South attend less-segregated schools than those in the Northeast, though segregation in the South has increased in recent decades, according to the report. In 2011, some 34% of blacks in the South attended schools where at least nine-in-ten students were minorities. While that’s up from 26% in 1991, it’s far lower than 78% of students in 1968 that attended “highly segregated” schools. In the Northeast, some 51% of blacks attended highly segregated schools in 2011, a slight increase from twenty years earlier.